Collingwood's Victorian Wheelchair Football League captain-coach Brendan Stroud and club champion Chris Tarrant helped launch the new VWFL competition at the Holden Centre on Friday morning. Photo: Collingwood Media. 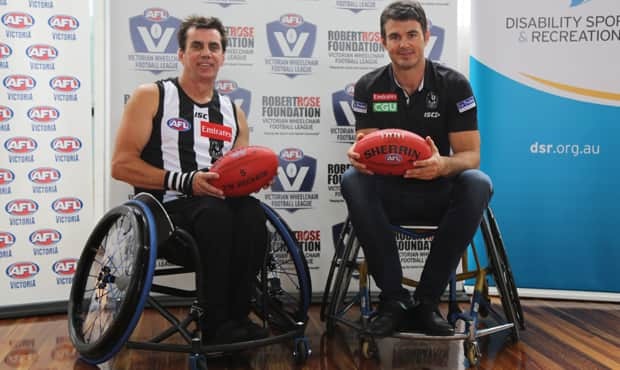 Collingwood is proud to be fielding a team in the inaugural Robert Rose Foundation Wheelchair Football League (VWFL). As one of Australia’s most inclusive sporting clubs, Collingwood has long-standing AFL and VFL programs, and is also represented in the AFLW, VFLW, Super Netball and Australian Netball Leagues, providing important opportunities for women and people with a physical disability to compete in their chosen sport at an elite level. Australian wheelchair basketball and tennis representative Brendan Stroud will captain Collingwood’s wheelchair football team, having played for and coached Victoria’s team in the 2017 Wheelchair Aussie Rules National Championships. Stroud became a paraplegic at the age of 22 when he sustained a spinal cord injury after a car accident and has since become a passionate advocate for road safety, mental health and disability awareness. Collingwood’s VWFL season will start in May, with 10 rounds to play before a Grand Final in September. Collingwood captain-coach Brendan Stroud joins his Hawthorn, Essendon, Richmond and St Kilda opponents to launch the new competition at the Holden Centre. Photo: Collingwood Media. The Robert Rose Foundation is named in honour of former Magpie and famous sporting star Robert Rose, who became a quadriplegic following a car accident in 1974. Robert was the son of Bob Rose, who is one of the most famous Collingwood footballers and coaches of all time. The Rose family is synonymous with the Collingwood story, for Bob was one of four brothers to play their careers at Victoria Park. For a player to be eligible to participate in the league, he or she must identify has having a physical disability. Games will be played on a basketball court. Each game should be played with five players on either side, which is the maximum numbers of players on the court at one time. The minimum to constitute a game is three against three. There are no restrictions to how many players can be on the bench. The appropriate ball for the VWFL is a size five synthetic Sherrin. All matches shall consist of four 10 minute quarters with no time on. What positions do the players play? There are designated zones (forward, centre and defence) which dictate where assigned players can play. A handball is equivalent to a kick, and a single handed underarm throw is equivalent to a handpass in wheelchair football. When throwing the ball, the players’ arm must remain under shoulder height for the disposal to be legal. There is no kicking in AFL Wheelchair. A double-handed chest pass is classed as an illegal disposal. At a centre ball up, both centre players must contest the ruck. Each team is permitted to have one additional team member in the centre zone. Should a team have more than one additional team member in the centre zone, a free kick will be awarded against the offending team. Peter Rose, the brother of the late Robert Rose, speaks on behalf of the Robert Rose Foundation. Photo: Collingwood Media.